President Trump has changed the face of the fight against climate change. He has appointed Scott Pruitt to lead the EPA. He has pledged to repeal the Climate Action Plan. He has threatened to remove the United States from the COP21 Paris Agreement. He has dismissed scientific consensus on anthropogenic climate change. All of these actions have something in common: they signal the arrival of a federal government committed to ignorance in the face of science and recklessness in the face of an impending climate disaster. As the Trump administration stakes out a new national stance toward climate change, Harvard must shift its own stance in response. Now, more than ever, it is imperative for Harvard to end its financial support of the fossil fuel industry. To continue the status quo is a problematic endorsement of business as usual in an environment where facts and science are increasingly characterized as political. Harvard no longer has the luxury of taking an apolitical position and the University’s refusal to take a “political stance” is in itself a political statement about the acceptability of science denial. Therefore, we ask that Harvard take a first step towards accountability. In this first semester of Mr. Trump’s presidency, we demand that Harvard divest from coal and publicly promise to never invest in the industry again. We present this plea in light of Mr. Trump’s steps to revive the industry. Coal, with its innumerable health hazards, is the most dangerous form of dirty energy. It is also the bedrock of the president’s climate agenda. Ignoring the human suffering and environmental degradation caused by the industry, Trump, along with his cabinet appointees and the EPA transition team, have highlighted coal as a fuel of particular interest. Just last month, the President dissolved regulations to safeguard waterways from coal mining waste. His cabinet appointees only promise more of the same action. With former ExxonMobil CEO Rex Tillerson confirmed as Secretary of State and Rick Perry―whose hopes are to to unleash “hundreds of years in clean coal reserves”―leading as Secretary of Energy, it makes a kind of perverse sense that Scott Pruitt should be Trump’s pick for the EPA. Pruitt, as Oklahoma Attorney General, took the opportunity to bring numerous lawsuits against the environmental agency he now hopes to lead. As recently as last year, the Oklahoman unsuccessfully tried to sue the EPA to prevent regulation of mercury production from coal plants. There’s no question that now the stakes have shifted. The question becomes, how can we, as individuals and communities, resist this new administration? In order to resist an administration that has committed to running pipelines through sacred land and to salvage the dirtiest form of energy on earth, we must use all means possible. By divesting from coal and refusing to profit from a propped-up revival, Harvard can demonstrate leadership in resisting a backward approach to energy in the reality of climate change. 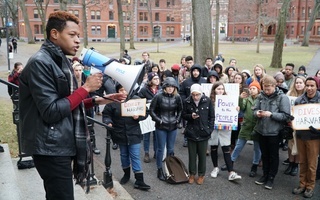 In the past, Harvard has refused to divest on the grounds that using the endowment to exert “political pressure” would not be in line with its mission of research and education. It has pointed to climate science research and on-campus emissions reductions as a more mission-appropriate means of addressing climate change. But times have changed. Those policymakers who were receptive and responsive to climate research have been thrown out of the window with the arrival of a national government that is openly hostile to the research that Harvard claims is the only appropriate means for action. Climate change denial—and fact-denial more broadly—pervades the White House. With the silencing of scientists’ voices and proliferation of alternative truths it becomes clear: Harvard’s academic mission has become politicized, in spite of itself. Inaction on the question of divestment is no longer proof of impartiality. Rather, inaction is proof of Harvard’s allegiance to a dirty energy agenda. On February 17, we sent a letter to President Faust, asking for Harvard to vote on the right side of history. We asked for Harvard College to announce their permanent divestment from the coal industry. We asked that President Faust and her administration respond to our letter by Friday, March 10. We, the members of Divest Harvard, hope that students, faculty, and alumni will lend their voices to pressure Harvard into acting with a conscience. The clock is ticking. We hope you’ll join us. Sidni M. Frederick ’17, a former Crimson Multimedia Chair, is a History & Literature concentrator living in Quincy House. She is the education coordinator for Divest Harvard. Jonah C. Hahn ’17 is a Social Studies concentrator living in Pforzheimer House. He is a senior member of Divest Harvard. Mattea M. Mrkusic ’17 is pursuing a Special Concentration and living in Dudley House. She is the media coordinator for Divest Harvard. The authors write on behalf of Divest Harvard. As managers of such enormous endowments, institutions like Yale and Harvard have a responsibility to use their resources to further the mission of the institutions. Investing in companies who profit by destroying our future is incompatible with Harvard’s mission. While Corporation members maintained during the meeting that Harvard will not divest from the fossil fuel industry, they did say the University is currently not investing in the coal industry. Simply put, it is the supply of and demand for fossil fuels that creates the valuations of energy companies, not the reverse. Divestment has no ability to alter these basic economic realities.